Please "like" me on Facebook OR read my blog for a nightly recap of Fire in the Triad posts to stay in the loop. You can also follow me on twitter @niksnacks and the hashtag #CompDiningNC for live updates during each battle (dinner begins at 7pm). Please also "like" Competition Dining on Facebook or the web. Chef Michael is a Fire in the Triad veteran and made it to the finals in 2012 before being bested by Chef George C. Neal of 1618. Chef Wes is a newcomer to Competition Dining. Beginning at noon the day of the battle, not knowing anything except sheer talent and luck-of-the-draw will help them win each competition, each chef and his or her team of three go in knives deep, to try to out-cook one another. Each night, in “Iron Chef”-style format, dinner guests turn into dinner judges and are presented with a six-course menu (three from each chef) created around local/North Carolina ingredients. The featured secret ingredient must be used in each course. Professional culinary judges for the evening: Chef Jay Pierce of Lucky 32, Brian Clarey of Yes! Weekly and John Batchelor, author and food critic for Greensboro News & Record. Tonight's secret ingredient: Poulet Rouge Fermier from Ashley Farms in Winston-Salem. We've seen Poulet Rouge before, but nothing like this: WHAT THE CLUCK?! For all intents and purposes, I am going to refer to the poulet rouge as chicken from here on out. The smoked chicken was a nice island in the sea of balanced gazpacho. The smoke came through and it wasn't overpowering or barely detectable. 'Tis almost the season for gazpacho. Tomatoes are not yet in season and need acidity to bring out the wonderful tart, juicy, piquant flavors of summer's favorite fruit (sorry, to disappoint you, berries) and that was present in the form of sherry vinegar, I think. The red onion jam was sweet and spicy (I suspect from the chipotle) but there was no sign of pineapple glaze on the chicken. The cilantro creme fraiche got lost in the intense flavor of the soup, but thank goodness for the garnish of fresh cilantro! Where a gazpacho is expected to be chilled, chicken confit and johnny cakes are not. Not my favorite dish of the night, the dish components were all cold and didn't seem to create a cohesive dish. If they had been crispy and hot (or even lukewarm), I would have enjoyed the johnny cakes more. I will say that the confit was not stringy, greasy or otherwise unpleasant. Unfortunately, the vinaigrette had no signs of chicken cracklins. It did, however, have a fine dice of celery and tasted like a dressing for potato salad. And looked like it too. Serving "chicken 'n' dumplin's" in the South is not a task that should be taken lightly. Everybody has a recipe, a grandma, an auntie or a restaurant where they like to get this dish. You can't mess with perfection too much, or else people will get upset. This dish elevated chicken 'n' dumplins to a new level. The white wine gastrique gave the chicken a soft, subtle sweetness in the chicken veloute sauce. The sweet potato nest tasted like sweet potato flavored straw, but I appreciated the additional texture it gave the dish. The garnish of fried sage leaf gave the dish an assertive, earthy tone to balance the veloute. The "dumplin" part of this dish was really the cheddar-black pepper-sage biscuit. This was the best biscuit I've had since the beginning of the competition in '12. At this point, it stopped being battle poulet rouge and became battle chicken 'n' dumplings. The lowest scoring dish of the night, the dumplings here were actual dumplings and not a biscuit, but when compared to the last dish and paired with the smoothness of black garlic, the Asian flare did not go over well. The addition of country ham tethered the dish to its Southern roots (no pun intended, I promise) and those salty, crispy bits accented the perfectly grilled chicken. All of the diners at my table were wondering if we were going to have chicken as dessert or one or more savory courses. Well, our dessert prayers were answered. The highest scoring dish of the night, the flavors here were the most familiar. The scone was really delicious. It had a nice crumb and texture with bits of apple and the sprig of rosemary sticking out of the middle of it made me believe there was rosemary baked in. The caramel sauce heightened the sweetness of the scone and the prickly pear ice cream was nice and smooth. The candied chicken skin was not executed as well. It was too tart, bordering on bitter and too small. Fried chicken! It's what every diner dreams of when they find out they'll be eating chicken all night long. The first fried chicken of Fire in The Triad '13 came out of the gate clucking. An upscale version of chicken and waffles, this was my favorite dish of the night. The powdered sugar, accented the top like a snowstorm in Spring: unexpected yet reason to celebrate with a grocery store run to get eggs, bread and milk. Eggs, bread and milk are exactly what we got. 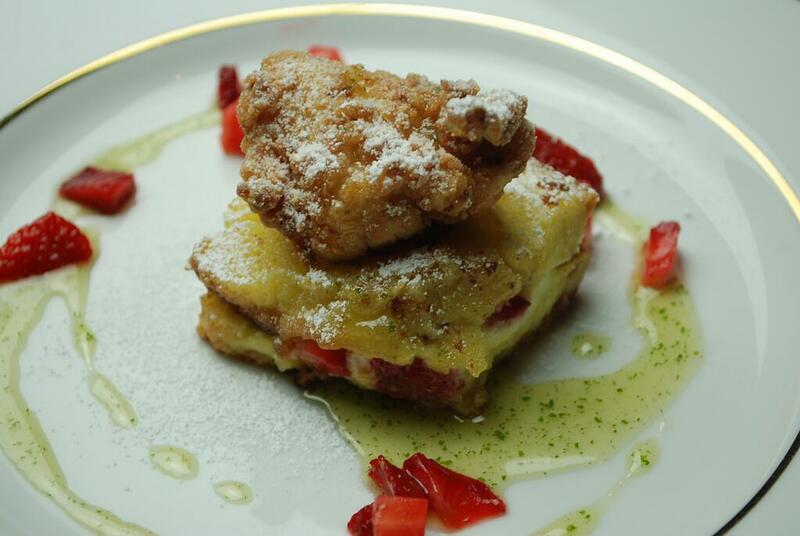 The egg-battered brioche had creamy ricotta and bits of fresh strawberry tucked inside and I loved every bite. The crown and jewel-piece of fried tenderloin was crispy and delicious. The mint ginger syrup was the perfect sweetness and thickness to help me chase the strawberries and bits of bread around my plate to make their way to my mouth. Overall, each team presented creative and inspired dishes but the prevailing chef was Chef Wes Patterson of Southern Roots. To see the score breakdown and dishes side by chef, please visit Competition Dining's website here. Stay tuned tomorrow night to read a recap of Fire in the Triad: Greensboro Country Club of Greensboro Vs Old Salem Tavern of Winston-Salem! Enjoyed talking to you last night! Hope to see you again soon. It was nice meeting you last night too!